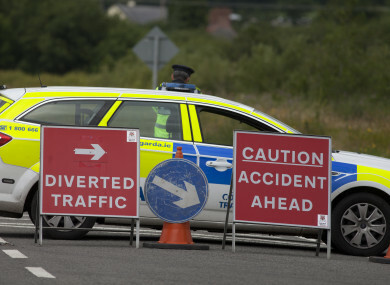 A MAN IN his 50s has died following a collision in Kildare. The motorcyclist was killed this afternoon on the R445 near Monasterevin. A man aged in his 50s was fatally injured when his motorcycle collided with a 4×4 vehicle. The driver and sole occupant of the 4×4, a man in his 60s, was also taken by ambulance to Naas Hospital. His condition is not known. The R445 is currently closed to traffic west of Monasterevin to facilitate Garda forensic collision investigators and local diversions are in place. The local coroner will be notified. Gardaí are appealing for witnesses to contact Kildare Garda Station on 045-527730 or the Garda Confidential Line 1800 666 111. Email “Motorcyclist (50s) killed in collision with SUV”. Feedback on “Motorcyclist (50s) killed in collision with SUV”.